Next week's CES 2018 tech extravaganza promises to be quite a show, and the latest in a long line of new products to be previewed is a rollable OLED TV screen from LG Display, measuring an impressive 65 inches from corner to corner. The new screen is in fact a bigger version of a flexible 18-inch display the company showed off back in 2014. At the time, LG promised that larger versions of the technology were on the way, and it seems we'll be seeing evidence of that next week in Las Vegas. Based on the preview images LG has sent out, the screen slides down into a compact base when it's not needed, which could be useful in all kinds of home theater setups. As an added bonus, the TV display boasts a 4K resolution for all your Netflix binge watching. Other details about the display – not least if and when you'll actually be able to buy it, and for how much cash – are thin on the ground. Tech firms will often tease new gear ahead of CES itself just to get the hype train rolling, and in this case we're happy to oblige. 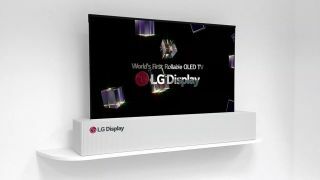 Of course there's a big difference between being able to get something like this ready for a CES show and having the technology in place to produce it at a reasonable cost for the mass market, but even at the prototype stage this shows LG is getting better at building these kind of rollable OLED screens. TechRadar is going to be on the ground in Las Vegas next week, so we will of course bring you news of all the best gadgets and gizmos as they're unveiled. A trip to the LG Display booth to take a proper look at this rollable TV screen is definitely on our to do list.